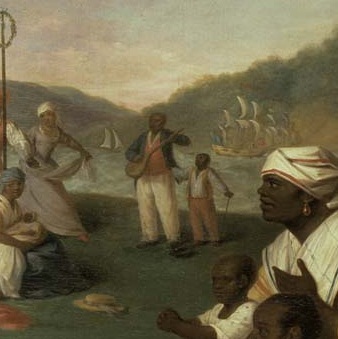 Of all the musical instruments brought to the Americas by enslaved Africans, the banjo came to have the most prominent spot in the New World's emerging culture. It was written about extensively, adopted by Americans of European descent, and ultimately incorporated into the Minstrel show, America's first popular musical form. Along with the banjo came a unique tonal and rhythmic sensibility. It was this instrument that made African cultural traditions audible to the otherwise prejudiced European ear. In order to recreate these instruments, Pete Ross has thoroughly studied written descriptions and illustrations of the banjo from the Eighteenth and early Nineteenth centuries; examined contemporary African instruments similar to the banjo; and measured and photographed surviving nineteenth century gourd fiddles. ​Until now, we’ve had no idea how this genesis instrument of American music sounded. The goal of Jubilee Gourd Banjos is to again hear these lost sounds. Pete takes every effort to recreate the gourd bodied, African American banjo as it was known before the various European American “improvements” on it were made. "The Instrument proper to them is the Banjar, which they brought hither from africa..."
To achieve greater authenticity in look, feel, and sound of historical recreations, Pete often uses pine and cypress (specifically named in period sources) salvaged from 150 to 200 year old buildings. Whenever possible, the tools used to build a historical recreation of gourd banjo are limited to those available to a turn of the eighteenth century craftsman. Once planed and carved into their final form, the banjo necks are scraped smooth and can be finished with an 18th century style beeswax and linseed oil finish. Though this may sound primitive, the final necks are smooth to the touch and very playable. A variety of other finishes can be used as well, such as shellac, or modern oils, depending on the needs of the particular project. All of this research and work done at a painstaking, 18th century pace has, in the end, paid off. Pete Ross’ efforts and those of his instructor Scott Didlake equal more than 35 combined years of study and labor. Their work has resulted in the most faithful recreation of the banjo as it was known in the 18th century. Not only do the instruments match period illustrations, they are also highly playable, and produce the beautiful, once lost sound of America’s instrument in its original form.